Whether you’re looking for a built-in, built-under, single or double oven, Belling is well-established as one of the country’s favourite oven makers. Made in the UK, Belling ovens enjoy a well-deserved reputation for first-class build quality and smart, innovative design. Belling ovens are available in gas or electric models. Whichever you favour, Belling’s dedication to quality is obvious. Stylish but practical design won’t look out of place in any kitchen and energy-efficiency is a hallmark, so you can expect to see everyday energy bill savings. 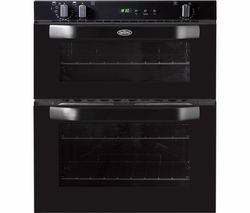 The popular BI60FP Electric Oven is a good example of what you can expect from a Belling oven. 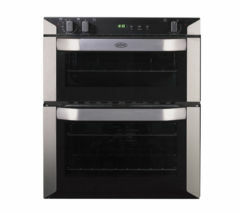 Styled in classy stainless steel, it features a 58-litre fan oven coupled with a variable electric grill so you can cook a selection of foods to your liking whether roasting vegetables or grilling fish and meats. Most importantly, this hard-working electric oven can be relied upon to deliver delicious results thanks to a fan oven that provides even, multi-level cooking – great for when cooking different dishes on several shelves at once. For those who favour a gas oven, the BI70G Gas Built-under Double Oven showcases the same qualities – you can expect great results thanks to impeccably even cooking and take advantage of 63 litres of oven space over two ovens. And if you’ve ever slaved away cleaning an oven you’re sure to appreciate Belling’s easy-clean enamel interiors. Our extensive kitchen department has ovens for every kitchen. Browse our built in double ovens, including models from the likes of AEG, Bosch and Hotpoint, or see our built in single ovens to view the latest Neff, New World and Rangemaster ovens.